What happens when you toss 15 writers in a cabin for the weekend? You get one heck of a writer’s retreat. The fearless (and very silent that weekend) leader of NCOhW (North Central Ohio Writers) plotted an amazing retreat for us to all get together, talk, and write. I won’t go into all the details of what we did, as there are already three other posts that describe some of the events (just beware of language, if that’s a thing for you). For me, the best thing was being able to spend the time with such a great and diverse group of people. This Writing Tribe that I call friends, new and old. As a person (and writer, runner, parent, sibling, etc.) your tribe (or tribes) are key to your success. They keep you going strong. They encourage you. They help when you are down. Don’t neglect your tribe(s), they are worth it in the long run. Scrivener, from Literature & Latte, is a great program for writing on a desktop or laptop computer. But there are times when it’s either inconvenient or not possible to work from either. Now almost everyone has a phone or tablet these days. That’s why Literature & Latte (L&L) decided to build Scrivener for mobile, starting with iOS. I’ve been using the iOS version for a couple months now, I was part of the first round of beta testers. All I can say is that this product works. I have had no issues with the Dropbox syncing feature, and the ability to write away from my home computer is amazing. And I don’t need an iPad to write, my iPhone works just fine. Toss in a wireless Bluetooth keyboard, and I’m all set. I could go in depth with the features, but I won’t. Because L&L has been doing an excellent job with their blog posts on the features. I’ve got links to all of them at the end. Plus, I can’t explain everything as well. One caveat users need to know: this isn’t the desktop version. Phones and tablets might be more powerful than the computer that landed the Apollo mission on the moon, but they do not have the power of modern desktops. There are features that are scaled back. There is a Compile feature, but it can’t do everything the desktop can. You can’t view multiple documents as one (Scrivenings Mode). The iPad display allows you to work with the Binder, while the iPhone doesn’t have enough real-estate to allow it. Those are a couple of the larger ones I’ve noticed. As with desktop Scrivener, this product won’t be for everyone. If you are looking for a mobile document editor that has a lot of good features, you won’t go wrong with iOS Scrivener. Especially if you already use the macOS (OSX) or Windows version of Scrivener. It is an excellent addition to your toolbox. Android users, don’t despair. It has already been mentioned that L&L would like to make Scrivener for your system as well. Also, it sounds like the next major versions of macOS and Windows will have the same features. As it is, there are only a few the Windows version doesn’t have now. The future of Scrivener is looking good. There is a built in Tutorial Project. Read (and work) through it (in app). It is a big help. You can also read through an online Tutorial. I haven’t looked through most of it, so I’m not sure how much is the same as the in app tutorial. If you are having Dropbox Sync issues, L&L did a Sync Screencast to walk through how to set it up. If you are still having issues, there is an article about Dropbox Syncing with iOS on their bug report page. If nothing else, the L&L iOS Forums is a great resource as well. Yes, it’s been a while. And joking aside that wasn’t intentional. Life happens, and I had a number of posts that I meant to write and post. Obviously, that didn’t happen. Since that last post there has been a lot of second guessing and doubt on my part. Both with the writing and what to write. Truthfully, many of my political and religious ideals wouldn’t be popular. And I don’t think I’m that exciting of a person. I don’t have big adventures all the time. So why would anyone want to read the thoughts of someone like me? Maybe those are the exact reasons. As humans, we grow by being challenged and reading (or doing) things we aren’t comfortable with. Going forward, I’ll have a mixture of things, similar to what I do now.So expect more book reviews, cooking, and writing related things. I’m sure I’ll end up with some political and religious things at some point as well. After all, it’s part of who I am. But, the next thing I’ll be posting will be a Preview / Review of the iOS version of Scrivener. I’m a huge fan of the program, and the iOS version will be here shortly. I’ll explain more soon. The other thing that you will probably notice in the coming months are more posts that weren’t here before. I’m going to work on merging some relevant posts from my other my Hero’s Tale blog just to consolidate more common topics. So, I’ll see you in a couple days when there’s some Scrivener talk! Today, I’m going to be reviewing Maelorum, Volume 1, by William Fincher. The book launched in 2012 with the first of two successful Kickstarter campaigns. The second campaign brought a reprint, along with a hardcover version and some fun extras. William has proven that he can run and deliver a successful Kickstarter campaign. I say this because the campaign for Volume 2 is coming October 10, 2014. This review is something that’s been on my to-do list for way too long. Specifically, since I worked through the book after backing it the first time. And with Volume 2 on the way, I wanted to make sure people were aware of its existence. So with apologies to Mr. Fincher for the tardiness, let’s get this rolling. It is no secret that I enjoy the Destiny Quest series of gamebooks by Michael J. Ward. I’ve reviewed the previous two entries, The Legion of Shadow and The Heart of Fire, each getting high marks. So it’s a no brainer for me to review The Eye of Winter’s Fury, Book 3 of the series. When I read the blurb, the concept sounded familiar: A prince traveling into the frozen north for a chance to save his kingdom, and losing himself in the process. The story idea is similar to Warcraft 3 and its expansion The Frozen Throne by Blizzard. But that is where the similarities end. If you want the short version of this review: yes, get this book. Read on for a more detailed look. The Eye of Winter’s Fury starts with all guns blazing. Or maybe, all arrows flying: Betrayed by those protecting him only to be saved by a demon prophet. Then dying from the northern elements and returned to life by a spirit bear. As the Crown Prince to the throne of Valeron, Arran doesn’t have an easy life. Or un-life, for that matter. And the story doesn’t pull punches. The only person I’ve seen put their characters through more is George R. R. Martin. Elements of Norse mythology have been pulled into The Eye of Winter’s Fury, further enhancing the world. It’s fun to see bits of stories that I’ve heard and read in another form. And the storytelling is top notch. Michael has done great work writing and refining the story. After the work I’ve done with editing some of my writing, I can appreciate how hard it is. Michael has done a remarkable job balancing the game system. The concept has not changed since the first book. No reason to change something that is working well. The equipment is dolled out regular enough that you never feel underpowered. One addition is a new set of skills: Death Moves. These are abilities that you are able to use after you defeat an enemy. So it is really only useful when fighting multiple enemies, which you will be doing a lot of. It’s an exciting addition, and they add a new layer to the combat system. Two that I have obtained with my rogue help me whittle the remaining enemies down. In one battle, I was able to win in three rounds with no damage to myself. Another fun addition is the use of vehicles. In the first act, there is a dog sled race that you are able to participate in. You buy your sled, lead dog, and some extra equipment, and can then participate in the races. The rules use the same system for skill checks. You are given a stat to roll against, for instance a Toughness of 9. Then you roll two six sided dice (2d6), and add in your current Toughness value. If the result is equal or higher, you succeed. If not, you fail. It’s a simple concept, and works great. From my flipping through the book, I know there are some more opportunities in Act 2 for more. I look forward to it. Yes, I’m only through the first of 2 Acts. Even with the shortened Act structure, the action and story is as fast paced as the 3 Act structure of the previous books. Maybe more so. While I wish the book had 3 Acts, it doesn’t suffer. Michael fit everything in that needs to be there, and more. That is a testament to his writing ability, as well as the gameplay testing that went into the book. As for only being a bit more than half way through the book? Yeah, I take a while to work through these. I can say with assurance, though, that this is a worthy addition to the Destiny Quest series. It may even be the best yet. There is no doubt in my mind that the Destiny Quest series will be viewed in the same way that the Lone Wolf series is in the future. It is an excellent series and people will be playing through them to read the story again and again. Michael J. Ward has proven his ability to write a compelling tale that is worthy of a novel, but contained in a game form. Unfortunately, the series has been put on hold for now. While gamebooks have seen a resurgence, they are still not as popular as they were in the 1980’s and 90’s. That being said, I’ll be keeping an eye out for Mr. Ward’s future projects. Again, The Eye of Winter’s Fury is an excellent addition to the series. You won’t regret the purchase. I want to add that I was given a copy to review by Michael J. Ward and Gollancz. These are my opinions as a fan, nothing more. Thank you to Michael and Gollancz for the copy of an excellent book. 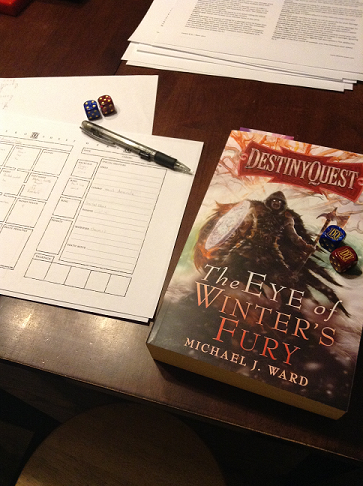 The Eye of Winter’s Fury, Book 3 in the Destiny Quest series, arrives Thursday, April 17. In honor of it, I thought I’d offer a recap of the other books to help remind what has gone on so far. Be aware that there will be spoilers here on out. If you don’t want to have the story of the previous two books (which I highly recommend) ruined, then don’t read any further. You have been warned! That’s a face only a mother could love. In October 2011, I reviewed DestinyQuest: The Legion of Shadow by Michael J. Ward. 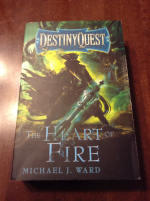 In November 2012, DestinyQuest: The Heart of Fire, Book 2 of the series, was released. So the burning question, should you read the sequel? If you enjoyed The Legion of Shadow or gamebooks as a genre, the short answer is yes. But most of you want a more detailed reason, so read on. I’m separating my Year In Review post into Writing and Personal this year. I had too much to think about, and just couldn’t combine them. So, If you’re interested in my 2012 Writing Perspective, click the link to go read it. So what do I think of 2012 on a personal level?